Swedish fishing instructor Erik Axner spent 20 minutes struggling against a fish he hooked off the coast of Norway, but let his 220-pound catch go once he reeled it in. 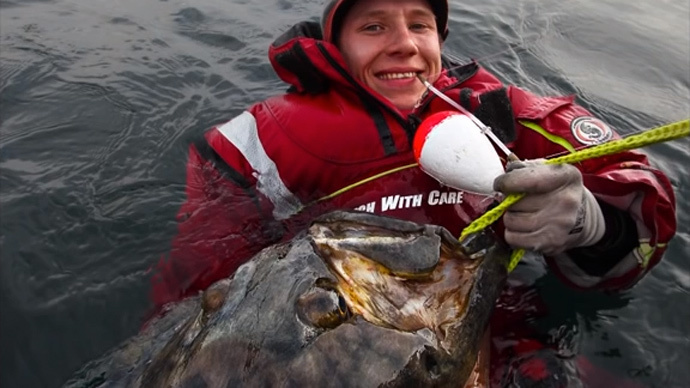 Axner, 24, told Swedish daily Aftonbladet he went out to the North Sea one day this spring in a small boat, armed with a specially-modified float he developed himself, with a coalfish mounted on to it as bait, to single-mindedly pursue his “dream fish” – one over 100 kg. After about an hour, the line began tensing, and Axner grabbed with both hands. His friend at the steering wheel turned on the engine to stop the fish pulling it into shallow waters, while another sensed that this was a big catch and began to film. “We struggled, but eventually it got tired, and we were finally able to bring it in, and secure it,” said Jonathan Jansson, who was behind the camera. The men immediately realized the fish would be too big to place on the boat. Instead, Axner put on a wetsuit and examined it. It was a “well-fed” halibut, measuring 196 cm, meaning that its weight was just over 100 kg, according to standard measurements. Axner’s dream was fulfilled, and after taking copious shots with the fish in the water, he unhooked it, and let it go. The biggest halibut caught with a rod was 232 kg, captured by German angler Marco Liebenow two years ago. The fish can live for over 50 years in the wild, and grow to over 350 kg in size – feeding on smaller species – so Axner and other professional anglers have their sights set on the next record. “Now, I want to catch a fish that is over 2 meters long,” Axner told Aftonbladet.